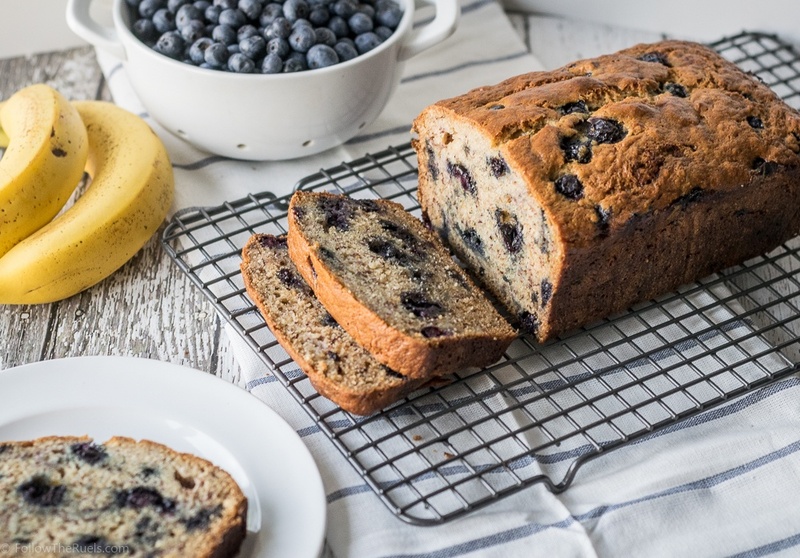 This Brown Butter Blueberry Banana Bread post is brought to you by the letter B. Actually, it's brought to you by gigantic container of blueberries on sale at Trader Joe's. Last weekend when I was out grocery shopping I picked up 2 lbs of blueberries because they were "a good deal". Once I got home I realized I had no idea how I was going to use all of them! I could have made blueberry muffins, but I looked around my kitchen and saw 3 brown bananas on my counter, so blueberry banana bread it was. To make this banana bread even better, I decided to brown some butter to add to this batter. Not only because I love alliteration, but also because brown butter is delicious. It's even more delicious than regular butter. When butter browns, it gets this toasty, nutty flavor that really adds so much flavor to whatever you put it in or on. It also helps that browning butter is very easy! All I do to brown butter is melt the butter in a sauce pan on medium heat and then let it simmer until it turns a nice amber color, like you see above. It only takes about 5 minutes to get the it perfectly brown. So I added the brown butter to the batter and once it was all mixed I folded in the blueberries. To prevent the blueberries from sinking to the bottom, I tossed them in some flour first before mixing them in. Then I poured the batter to a loaf pan lined with parchment so that I could easily remove the loaf from the pan when it was cool. The bread took about an hour to bake, then I left it out on the counter for another hour to cool before I sliced into it. I have to admit that I am not really a banana bread person, so maybe I am not the best person to judge this bread. But I did eat the small end slice and was pleasantly surprised! The crust on top was a tad crunchy, and the bread in the center was pillowy soft. The banana flavor was subtle (because I only used partially browned bananas, not completely browned bananas) and was perfectly complimented by the nutty brown butter flavor and the tart blueberries. The true test for this banana bread was taking it in to work. Between the co-worker whose wife is in culinary school and the other at-home bakers like me, we seem to always have some home-baked goodies in the kitchen. Which means that I have some very spoiled and picky co-workers when it comes to baked goods. I knew that if someone tried this and didn't like it, word would spread and I would be left throwing half a loaf away at the end of the day. The good news was the bread was gone by 10 am. Which means I can safely assume that it was a hit. Actually, I don't have to assume...people came by my desk to tell me they had a piece and loved it. So if you love banana bread you will love this recipe! If you kinda like banana bread, even you will probably really like this recipe. If it can win over someone like me who it not generally a banana bread fan, it must be pretty stinkin' good.